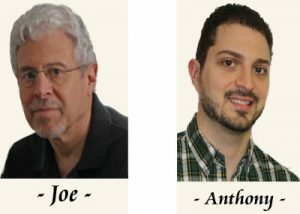 Joseph and Anthony Pandolfi are a dynamic (and thoroughly charming) father and son duo. They share a love of writing and photography, and a couple of years ago began creating poetry gift prints. Ever the adventurers, (and due in no small part to the grandchildren/niece and nephew in their lives), they decided to explore new horizons and journey into the world of children’s books. “The Adventures of Mophie and Picholas” series is the result of that endeavor. And a joyous endeavor it is! In short, a love of storytelling. And what child doesn’t love a good story? We try to instill our books with a sense of adventure, and always add a dash of humor (sometimes with a wink to the adults who may be reading the story to the little ones). One thing we don’t do is hammer home a moral. Every good children’s fiction book will contain one or more life lessons. But, in our opinion, these should be subtle by-products of an entertaining story, not something to be rammed down a child’s throat. Reading is supposed to be fun. Some writers are meticulous outliners. Others just sit down and let the muse guide them. We’re something of a hybrid. Before we start writing a book, we know where it’s going to start, what’s basically going to happen, and how it’s going to end. That’s the extent of our outlining. We’ve found that, within that general framework, it works best for us to let the story wend its way to the conclusion. Something a character says or does may lead you in a direction you didn’t foresee before you actually started writing. We use Scrivener software, which provides an amazing number of writing options, and accommodates pretty much any writing style. Several of our characters are in every book, so we know them well by now. New characters are a bit more difficult, because we have to invent a personality and bring them to life. (Paging Dr. Frankenstein.) After that, it’s a matter of asking ourselves how each of them would react to a given situation. As far as literally conversing with our characters, alas, we’re not that evolved. Besides, most of them are children and probably wouldn’t listen anyway. Don’t give up. You’ve probably noticed by now that writing is hard! But the beauty is that, unlike the ability to run a hundred meters in 10 seconds, good writing can be learned. If possible, join a writers group. If you don’t know of any, check with your local library. The other writers in the group will push you to keep going. Granted, it can be difficult to have what you believe to be a Nobel-worthy effort reduced to shredded wheat by your relentless–albeit well-meaning–colleagues, but that’s how you hone your craft. Remember: discipline and thick skin. After a lot of research, we opted to self-publish. Even if you’re able to sign with a publisher, these days they expect you to build a brand on your own. Most, if not all, the marketing is your responsibility. If you’re doing all that, why not self-publish and keep the bulk of royalties for yourself? Self-publishing appears to be the future, and it’s developed a respectability that didn’t exist a few years ago. You can upload your manuscript to various self-publishing sites for no upfront money (for paperback and e-books). You also can get your own illustrator, and it doesn’t have to cost a fortune. (A professional-looking cover is crucial.) Just make sure to have someone knowledgeable edit and proof-read your manuscript. Spelling, grammar, and formatting errors are the biggest complaints with self-published books. What genres do you write? : Children’s fiction.